We are thrilled you have entrusted us for your dental needs and we look forward to going through this journey with you. 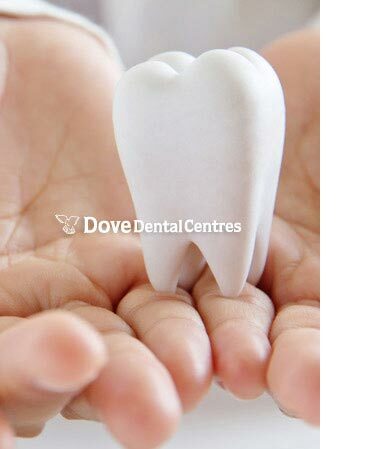 Welcome to Dove Dental Centres! We believe the following information will help you understand our intentions, as it allows us to build a flourishing relationship. We do pride ourselves on our comprehensive examinations and it is imperative that we understand and know your oral health, but more importantly, why things are the way they are. At the first visit we will obtain a detailed dental and medical history to chart any existing dental procedures, probe and note any periodontal pockets to determine the health of gums and their supporting structures plus relate the current condition of restorations and bone levels using an intra-oral camera. A Panoramic X-ray will be used to diagnose missing permanent or un-erupted teeth, indicate the presence of any cysts, tumors, abscesses, etc. and demonstrate the health level of bone holding your teeth. A Bite-Wing X-ray will be used to detect new or recurrent decay around teeth, under old fillings and any areas between teeth. The second visit may include Study Models to help you understand the overall position of your teeth, detect misplaced teeth, broken fillings, etc. and determine the relationship of top teeth to bottom teeth. A few days after the first and second appointments, you will have a Consultation Appointment, in which you will be able to have a one on one with your dentist to discuss your study models, x-rays, diagnostic report and the results of your examination. The Diagnostic Report will be prepared for you and provides a comprehensive review of the findings from your examination. While you are reviewing this information we encourage you ask any and all questions that you may have so that you and your dentist can have a full discussion. Your dentist will work with you to develop a treatment plan that best suits your needs. Broken dental appointments are a disappointment to everyone; they interfere with your dental treatment, and create unnecessary scheduling problems for other patients. We work hard to meet and accommodate the needs of all our patients and we are dedicated to providing you with the best dentistry and service available. Time is specifically reserved for each patient. Therefore, when sufficient notice is not given to cancel or change an appointment or do not show for your appointment, it does not give us enough time to contact another patient on our waiting list who would otherwise benefit from coming in earlier. When a convenient appointment is agreed upon, we feel that a commitment has been made. We understand that rare emergency situations may occur, and under those circumstances we can completely understand. We do have a 48 hour cancellation policy in effect and if sufficient notice has not been provided, a $75.00 charge will be added to your account. We understand the importance of the protection and use of your personal information and are committed to proper collection and disclosure. We also try to be as open and transparent as possible about the way we handle your personal information. All staff members who come in contact with your personal information are aware of the sensitive nature of the information that you have disclosed to us. They are all trained in the appropriate uses and protection of your information. Only necessary information is collected about you; information is only shared with your consent; storage, retention and destruction of your personal information complies with existing legislation, and privacy protection protocols; our privacy protocols comply with privacy legislation, standards of our regulatory body, the Royal College of Dental Surgeons of Ontario, and the law.